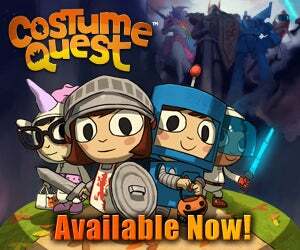 How would you like to play DoubleFine's Costume Quest for free? Codes are all gone. If you enter a used PSN code it gives you the demo, sorry for any confusion. Then you may be in luck, we've got five codes each for the Xbox 360 and PS3 versions of the trick-or-treating role-playing game. But you better hurry, they're going to go as fast as a King Sized candy bar on Halloween. Have fun with the game, and if you have a second, drop back in here to let people know which codes you took.